Thanks for the observation! Could you post a shortened link to a YellowBot business listing that’s receiving Google+Local reviews? Or a screenshot. Good post again Phil. Looks like Citysearch has removed the option to add a free listing. Thanks, Niladri! Yeah, the CitySearch people are impossible. I don’t get why they keep messing around with the free listings. But I believe I’ve been able to add them just by using the contact form. In any case, if you’re listed on the other big sites, your free CitySearch listing should eventually show up. Phil, Nice work! will reference this for sure in my Google+ Local tutorials. Sounds like an awesome plan, Matt – thanks! Grrr… I just wish I could use that over here! It must have taken you ages to work out and then draw out. It will be really useful for US businesses. 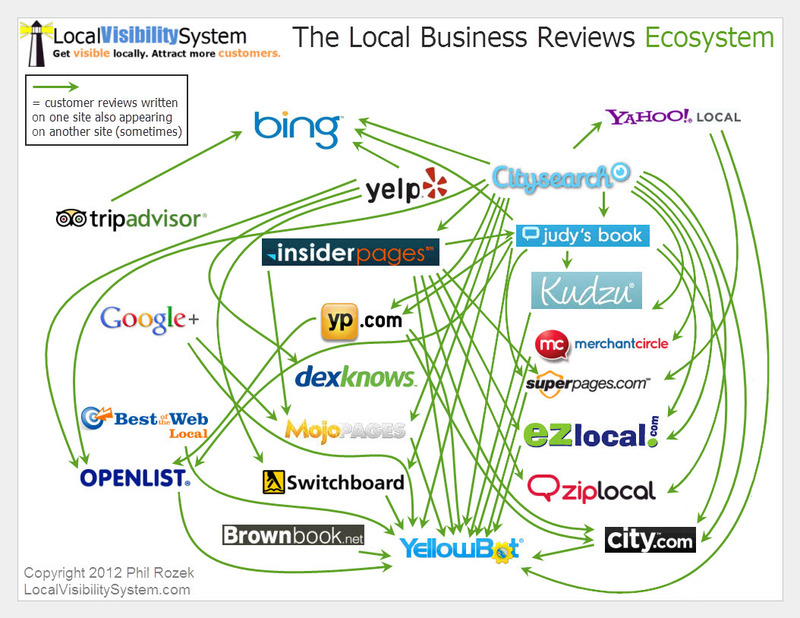 Kind of like what I mentioned to Darren about Canada reviews, I’d strongly consider mapping a UK reviews ecosystem. That would be cool, indeed. Some gruntwork was involved here, so I’d certainly be willing to collaborate on such a thing in the future. I’ll be adding a link here in my Advanced G+ Local training and heading off now to Scoop and Tweet this. Hey Linda, thanks for spreading the good word! Seriously, love your stuff ,so any time you want to blog for Catalyst I would love it! Email me and I’ll set up an account for you if you are game. Awesome! I’ll be in touch soon. Hi Phil, this is a great post. I will definitely share and reference. I am looking at the map and will let you know if I find any other sites that share reviews. Have a great weekend! Thanks! Yeah, it would be great if you were able to find other big or medium-sized sites, especially ones that feed others. I mean, YellowBot is a cool site, but there’s little need to ask your customers to go on there and review you, because it pulls in reviews from so many sources. Wow, Phil, you’ve nailed it again. Thanks for doing all that hard work for all of us. You are amazing! Hey Margaret, thanks for the kind words! I hope business has been great recently (it’s been a while since we touched base). Canada calling….hey, where’s our Cancuk List, eh? Great info, thanks for the post. I have noticed that Citysearch reviews do appear on a good majority of the primary us business directories. Just goes to show you defiantly need to have your business information displaying accurately on CitySearch. Indeed. Of course, the catch is that CitySearch’s free-listings feature is totally unreliable – as in there’s no way to edit your listing, and the “Submit a listing” form isn’t even on the site any longer. Which makes having InfoGroup/ExpressUpdateUSA.com listing even more crucial, so that you’re on CitySearch in the first place and can eventually ask for reviews there. This post, combined with the post about how to get listed on Citysearch has been a real help. Any time, Matt! Glad you’ve found those two posts useful. Thank you, this is insanely helpful. I saved it in my folder of marketing cheat sheets and even printed a copy to pin on my corkboard. I am building our search marketing plan with only Google and intuition as my guide. I quickly got the impression that it’s not humanly possible (or even beneficial to local SEO efforts) to submit to every single directory, but that there are a handful of key players that are worth the manual submission effort. We will also be using a modified version of your review handouts, and only want to establish as many ‘listing hubs’ as are need to cover our customers’ regular watering holes. Again I am flying solo in our in-house marketing department so anything that saves time by pointing me toward a shortcut is a day-maker. Thanks for putting this resource together and pointing me in the right direction, you earned a new subscriber. Sounds like a good plan. You’ll probably still want to go to the trouble of manually submitting to several dozen sites – over time, of course – but you’re right in saying that you don’t need to so for hundreds of them. As for reviews, you’ll want to have a plan to get them on Google+Local, Yelp, Yahoo, CitySearch, and maybe an industry-specific site – at the very least. Takes finesse and patience, but it’s worth it. 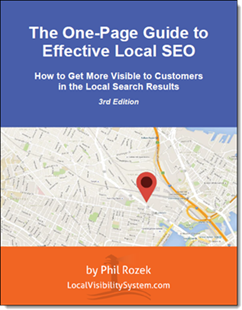 I’m sure you saw my “Complete Guide to Google+Local Reviews” post; it’ll help you with Google (obviously), and the best-practices I describe there also apply to other sites. Great Reference! I just printed it out to hang on the wall. Hi Phil—awesome article! Thank you for that (even years later!). Can you offer insight on two more sites that seem to advertise themselves as “the source of all review site content”?… They are “Localeze,” and “Yext.” It’s very confusing what role these guys play in the whole “spreading of content” arena..
Sure thing, Rob. Thanks for the compliments. Yext and LocalEze do not deal with reviews. At all. Only basic business info. Thanks. I guess I should have been more clear. I have taken a great deal of time claiming my business listings all over the internet (which so happen to be all the main review sites, like Yelp, Citysearch, YP, super pages, insider pages, etc, etc). The assumption is that I wouldn’t need the services of such business listing aggregators if I update all those pages myself. But it seems that I am now running into situations where I cannot update my own business information on sites like local.com and map quest.com without doing it through Yext, for a fee. It’s also not clear if I were to sign up with one of these guys, if they would override all the sites I’ve updated myself, or create dupes. That’s a good question, but a complicated one – and I can’t address it fully here. But in short, to update certain sites you have no choice but to use Yext. Yext deals with a lot of important sites, but I wouldn’t worry about trying to update the ones that can ONLY be updated through Yext. 1. the original is 2 years old. Do you by any chance have more recently updated version? Or do you feel that in essence it’s still the same? Again – thanks for such a high quality reference material! 2. It was original research. Some sites indicate which sites feed them reviews. In the other cases, let’s just say there was a lot of hard digging involved. Actually, most of my research involved Googling excerpts of a review, seeing which sites come up in the results, and then figuring out which site the review was published on originally. And then repeating. Very interesting to see what was happening in 2012. Today in 2015 it seems like Yelp is the one that now shares its reviews with many other and also that is used most by people. Yelp is getting bigger every year. Then there are some smaller, niche sites that seem to use Yelp’s API to show Yelp reviews.